"What I like most is the energy, dedication and passion in the industry. This is very unique", says Noelia Mansilla, a newcomer in the flower industry. After years of working in the chemical industry, she started as Head of Commercial Operations EMEA at Dümmen Orange in January 2018. She told us more about working in this rapidly expanding company and the opportunities and challenges that they and other breeders are encountering. 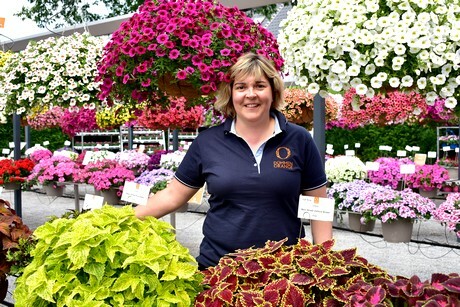 Noelia Mansilla at the FlowerTrials 2018 at the Dümmen Orange location in Germany. Following a doctorate in chemistry, 15 academic publications and a position as Associate Professor with a Spanish University, Mansilla moved into the industry in 2000. She worked at Bayer MaterialScience (now Covestro) for 14 years - where she acquired commercial experience on operative and strategic levels in different positions and countries - before moving to Wevo-Chemie in 2014, where she worked until Dümmen Orange crossed her path. Dümmen Orange approached her as they were looking for someone with a technical commercial background and, more importantly, experience in working both in a multinational corporation as well as in entrepreneurial environments. "Dümmen Orange is something in between – but definitively more than the simple sum of the companies that we have acquired and merged with. However we stay in line with the entrepreneurial principles of building business and putting customers always first, they have glued our organization", says Mansilla. But why moving to another industry? "For me, Dümmen Oranges clear visionto become the number one player in ornamental breeding through innovation and global expansion is what persuaded me. People think a clear vision is a given but not all companies have it. I’m eager to make the Dümmen Orange vision happen and create value through leadership and diversity. On top of that, and for me the icing on the cake, the company is established in The Netherlands, which is close to one of my passions: the sea." Dümmen Orange was established in 2015 and has been expanding rapidly by merging with and taking over breeding companies. What is it like to work for such a large and fast-growing company, can one still keep an overview? Regarding the fast growth, Mansilla considers this a blessing. "For some it can be a bit overwhelming, but what is wrong with an open, energetic workplace and collaborative culture that paves fast decision-making and makes things happen every day? The company is developing continuously, as employees we are growing and developing continuously while having the opportunity to leave our mark every day." While talking about keeping the overview in such a large company, Mansilla stresses that big and small are relative terms. "Think about the former companies I worked for. Dümmen is small compared to Bayer MaterialScience, but it is large compared to Wevo-Chemie. Speaking about keeping an overview is simply about having a fit-to-purpose structure in the organization. That is why, for example, we have launched our Integrated Product Teams (IPT) structure in 2017 overarching the traditional production, R&D and commercial functions in the company and helping us to keep the overview at crop level"
Mansilla has been working in the ornamental industry for five months now and what strikes her most is the energy, dedication and passion in all links of the chain. "When comparing it to other industries - and particularly the chemical - this is very unique." Another thing that surprised her was the technical level in the industry." It is much more technical than I thought." In these months at Dümmen Orange, Mansilla also discovered the opportunities and challenges that breeders in the industry are encountering. "One of the advantages of being a newcomer is that I am not contaminated by assumptions" According to her, there is a lot of change happening and this creates opportunities and challenges as two sides of the same coin in the industry. For Dümmen Orange, she describes three strategic focal points as change levers: sustainability, digitalization and retail. "We believe that sustainability has to be the differentiator, particularly in The Netherlands - companies in this country need to take the lead. We embrace sustainability as one of our core values and want to be the industry leader. Our GreenGuard protocol is a good example. Already in 2015, Dümmen Orange introduced Integrated Pest Management in Chrysanthemum at our farm in Uganda. We started utilizing biological controls in order to achieve more sustainable production to meet growers and retailers' demands. Since then we are implementing GreenGuard at our other farms as well." The final focal point Mansilla mentioned is retail. "We are breeders and our customers are growers, but together with our customers we currently witness the increasing influence of the retail sector. Because of this, we want to give our growers access to the largest possible assortment, to ready-to-sell concepts. This is why we are upscaling. Having more products and services under one roof will enable us to serve our customers even better and to be partners of reference to both growers and retail."